What to do with food emojis? That age-old question humans have grappled with since the dawn of the iPhone. In terms of our everyday cellular discourse, is there any use for them other than to express our appetite or sexual urges? 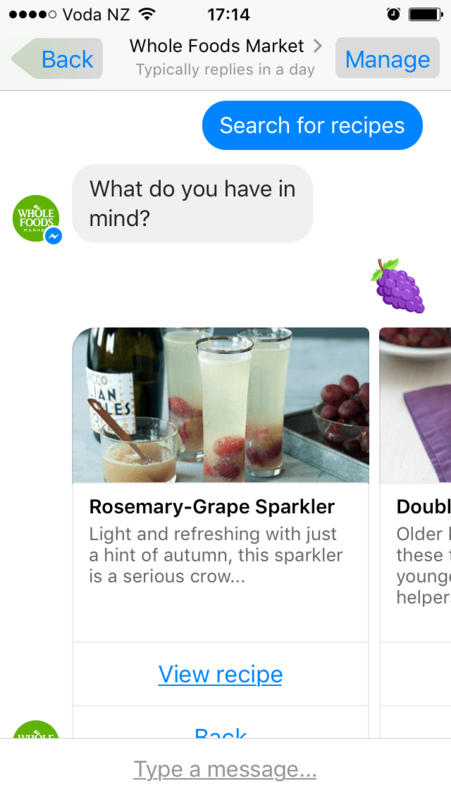 Whole Foods thinks it has the answer with its new chatbot for Facebook Messenger that lets you incorporate emojis into your quest to discover tantalizing, and healthy, new recipes. 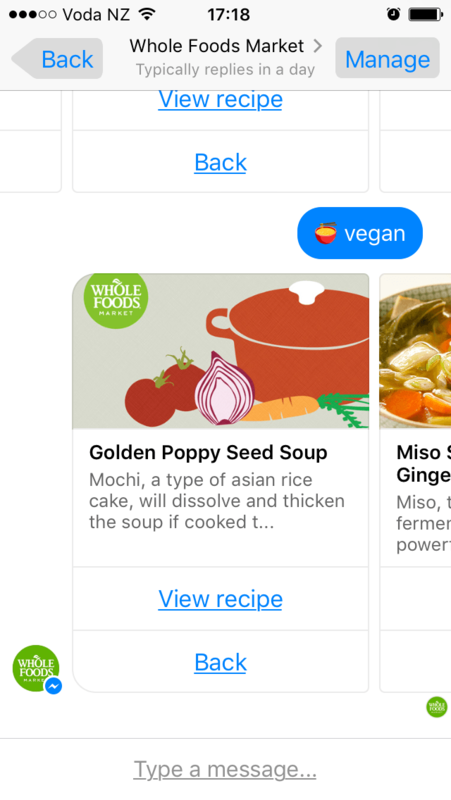 All you have to do to interact with the culinary AI is seek out Whole Foods on Facebook and begin a Messenger conversation, or search for the company on Messenger itself. The bot initiates the chat by explaining that it can “help you find some delicious recipes.” There’s no mention of emojis when you start, but don’t resort to boring old text. Take our word for it, you can break out those little icons to your heart’s content. 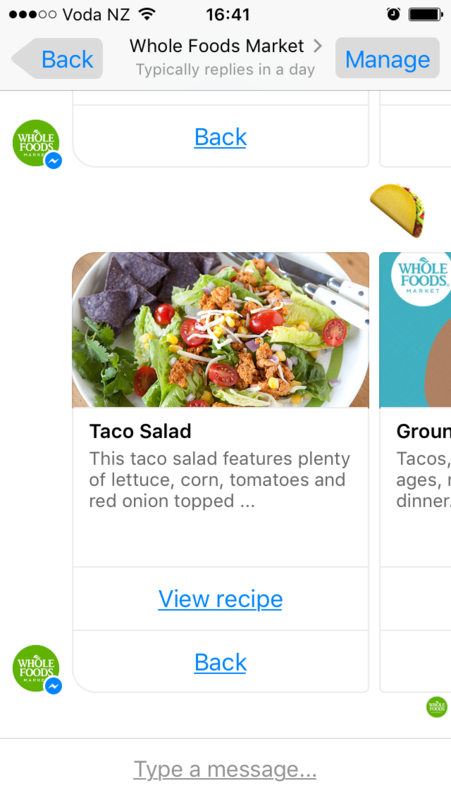 For example, if you were to enter everyone’s favorite food emoji (after the eggplant, and peach icon, ahem) the taco, the bot would hit you back with a slideshow of links to — yes, you guessed it — taco recipes. All the links navigate to the Whole Foods website, where you can also add the items you need to a shopping list if you have an account. Whole Foods claims that you can add text to modify recipes in accordance with any special diets you may have, seeing as there’s no emoji for “vegan,” unless you get really creative. Therefore, maybe it’s best not to ditch text altogether just yet — even if Facebook itself thinks you inevitably will at some point in the not too distant future. Unless, of course, like us, your diet consists of just pizza, and hot dogs — foods that can be expressed purely through emojis. If, however, you prefer to spend your days on your couch playing video games, there’s always the Pizza Hut chatbot instead.